The unusual pact echoes the way dogs began to be domesticated by humans and was spotted by primatologist Vivek Venkataraman, at Dartmouth College in New Hampshire, during fieldwork at Guassa plateau in the highlands of north-central Ethiopia. We do not in fact know how humans first domesticated wolves. Dogs were domesticated between 40,000 and 11,000 years ago, and although the process remains shrouded in mystery, one hypothesis is that it started when wolves began following roaming human groups to take advantage of the large carcasses they left behind after hunts. That may have encouraged other carnivores to keep their distance, offering a benefit for the humans, too. Eventually wolves may have even helped humans hunt better and outcompete other hominins, too. Who knows? As Holmes admits, we don’t know very much about human domestication of canines but whatever happened, it probably involved abstract reasoning, which the geladas are not likely to be doing. There were burial customs for dogs 30,000 years ago. Originally, humans may well have stolen puppies, who would be that much easier to domesticate if they grew up thinking that all human are alpha dogs. Life would be so simple if the geladas could be shown to be entering their very own Stone Age. But it seems likely that they coexist with the wolves in an ecology on which neither group reflects much. That’s just as well for the geladas; the supply of rodents is hardly guaranteed. See also: Apes can be generous Are they just like humans then? Are intelligence tests unfair to apes? Are apes entering the Stone Age? Since I spend a fair bit of days with a young dog and several young humans, I still have to believe that Domestication occurred when Dad brought a wolf puppy back to the cave instead of bashing its head in with a rock. Video games and endless cartoon shows being in short supply at the time, a puppy was simply the most fascinating toy a child could have. And it didn’t even need batteries. From the puppy’s point of view, the manpack was DARN close to a wolf pack, with an alpha male and an alpha female and everything. And lots of human pups to wrestle with. And when the pup matured, he (or she) joined in the manpack’s hunts, showing off his (or her) skill at tracking by smell. Surely, after seeing a domesticated canine in operation, EVERYBODY wanted one. Oh, I just remembered this bit of Ancient History. A million years ago, when dinosaurs still walked the Earth and my hair was not yet white, there was a musical group named “Three Dog Night”. A strange name, but it was The Time of Strange Names. The explanation was that Australian Aborigines, being rather basic in their kit, had not yet invented The Blanket when the English first arrived. And so when they bedded down for the night, it was a common practice to pull a dog (domesticated dingo) on top of themselves to help keep warm. And the colder the chill, the more dogs you grabbed. So a “3 dog night” translates as “pretty darn cold”. Anyone who has lived with dogs knows that dogs, especially puppies, will NATURALLY cuddle up next to the nearest available human before falling asleep. Skinny little cave-kids probably welcomed the mutual warmth. I begin to get the feeling that Dogs were Designed to fill a role in the manpack. This is one of the dumber articles I’ve read. The animals have a pseudo-symbiotic relationship because the wolves don’t want to pick a fight with the monkeys and it’s easier pray to eat the abundant rodents, we see this all the time in the wild, I really don’t understand why they would consider this domestication or beginnings of it. I think it’s more fascinating that a bird doesn’t get eaten while picking the parasites and food from in alligators mouth. 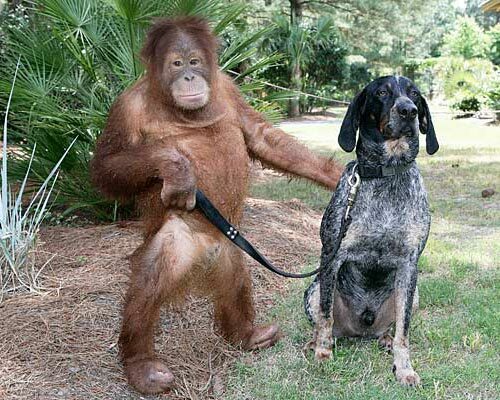 I would have expected the dogs to try to domesticate monkeys. Mung, monkeys are as much use to dogs as cats are. Hence no effort at domestication. Wow, it appears to actually be happening. photographic evidence. @ET That must mean ants have entered their own stone age, and will soon develop massive underground cities rivaling human civilization. The pesticide companies are eliminating the true superior species. Someone has to put a stop to this and give ants the rights they deserve.